A $800,000 slurry tanker-tractor combination currently making its way around farms across New South Wales is attracting attention for its high tech features and ability to inject up to 300,000 litres of liquid organic waste into subsoils every day. Leading recycling and waste management company Transpacific, who owns the slurry machine believes it is the only one of its type in the southern hemisphere. The company says the machine which consists of a Claas Xerion 3800 tractor and a Kaweco 24,000-litre slurry tanker, is capable of loading and injecting 24,000 litres of nutrient-rich solution every 10 minutes. Working in partnership with local councils, water authorities and environmental regulators, the business has been developing new ways to blend and utilise by-products from food manufacturing and sewage treatment as injectable fertilisers. According to Transpacific Organics regional manager Adrian Taylor, food production can often generate considerable volumes of liquid organic waste as by-product. "This could be anything from beer with the wrong label on it to wash-down solution from dairy processors," he says. "However, this waste has valuable properties in terms of nutrients, water and organic matter that are a recognised resource, particularly in agriculture." By injecting the waste into the soil, Taylor says the nutrients are delivered directly into the root zone of pasture and fodder crops where soil microbes can break down the waste and make it available for plant growth. 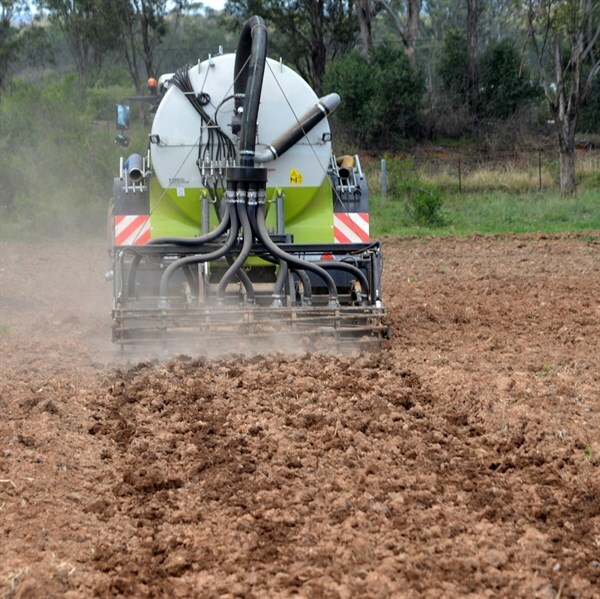 "We can deliver the equivalent of up to 30mm of rain with a nutrient profile that’s high in nitrogen, potassium, sulphur, minerals and organic matter – all the things that are expensive to add using conventional synthetic fertilisers," he says. As a result, Taylor says more and more farmers are queuing up to have their land injected with the liquid waste. A team of 25 consultants, agronomists, operators and technical support staff is constantly assessing and reporting on the machine’s daily operations to ensure it is adhering to set regulations and guidelines. "This is a fit-for-purpose program that causes no harm to the environment or human health," Taylor says. Transpacific Organics operates a fleet of custom-made tankers and equipment that transport and inject liquid products throughout NSW. In June, it added an integrated Claas Xerion 3800 Trac advanced technology tractor and Kaweco 24,000-litre slurry tanker to the line-up. Technical Operations Manager Chris Hetherington says both tractor and tanker fit the company’s requirement for purpose-engineered, high performance machines with minimum compaction. "The complete trailer and tractor weights about 50 tonnes fully loaded and we work seven days a week, 52 weeks a year, weather permitting," he says. "The Xerion has four equal-sized tyres, all-wheel power and all-wheel steering, which means we can operate under any conditions. "The trailer has the same-sized tyres and positive steering on the rear axle, so we’re leaving as little footprint as possible." Co-developed by Kaweco and Claas, the ‘swan neck’ trailer was designed specifically to fit the Xerion platform, down to its matching paint scheme. The tanker, which is connected to the tractor via a factory-fitted 110mm ball head coupling, is equipped with a high capacity Borger FL 1036 liquid displacement pump that is covered by the tractor’s high-flow auxiliary hydraulic system. It incorporates a hydraulic three-way valve, hydraulically driven cutter, stone trap and recirculation system to prevent blockages and to ensure a homogenous output. "The last thing we want from either an environmental or nutritional viewpoint is liquid coming out at the start and sludge at the end," Hetherington says. "The hydraulic drive from the tractor ensures a consistent flow and is way more fuel-efficient than a PTO drive. "It delivers a hydraulic flow of 236 l/m on demand, even at a relatively low engine speed of just 1600 rpm." Liquid product is then pumped to a custom-made injection system fitted to the rear of the tanker. Nine tynes set 400mm apart inject waste product at a depth of 35cm. "Application rates vary from 100,000 to 300,000 l/ha, so it’s absolutely essential the liquid remains underneath the surface from both an agronomic and environment point of view," Hetherington says. So far, the company has been rapt with the Claas Xerion 380’s performance. "We’ve had plenty of experience with other high horsepower tractors but we’ve never had anything like this," Hetherington says. 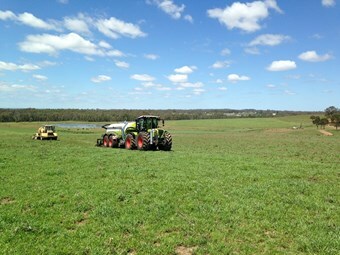 "This tractor is an OH&S dream – it’s easy to operate, it’s so comfortable and there’s no noise." The Claas Xerion features a full chassis frame powered by a 8.8-litre six-cylinder 379hp Caterpillar engine and ZF Eccom 3.5 CVT continuously variable transmission mounted as non-loadbearing modules. On board, it features the Claas electronic information system (Cebis) which monitors and controls all of the tractor’s key functions via a 210mm colour terminal and multifunction level integrated into the right armrest. The programmable CMotion multifunction level allows up to 20 functions to be adjusted with just three fingers. "We’ve set up three cruise controls for operating speeds of 2,4 or 6km/h, as well as automatic sequence control for lifting the injector, pump controls and flow rates," Hetherington says. "It only takes about four minutes to load and another four to unload, so our limiting factor is how quickly we can get going, complete each run and then get back to the tanker," he adds. "That’s where the sequence management function comes in handy." Hetherington says it took a couple of days for Kaweco and Claas technicians to set both machines up but the combo has worked a treat for Transpacific since. 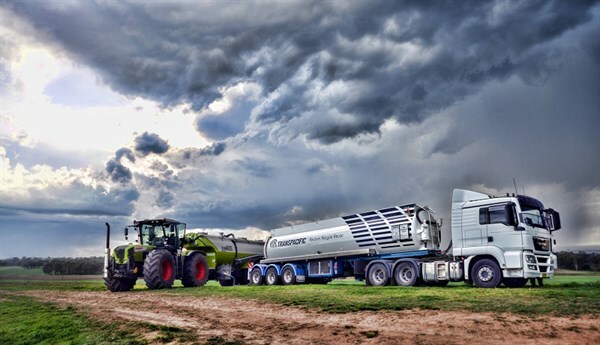 "Down the track, we’re looking at a Xerion 4500 Saddletrac and a 30,000 litre Kaweco tanker with a four wheel, single axle so we can get even more power and less compaction."